Reading Paul Spicer’s excellent book on George Dyson (Boydell Press, 2014), and listening to some of Dyson’s choral music, reminded me of what a great effect it had on me when I first sung it in 1958, at the age of eleven, as a first-former at St. Olave’s School, London. Then in Tooley Street, in the middle of dockland between Hays Wharf and Tower Bridge, St. Olave’s had a very good musical tradition and, under the directorship of Desmond Swinburn, exciting works like Stanford’s ‘Revenge’, Dyson’s ‘In Honour of the City’, Vaughan Williams’ ‘In Windsor Forest’ were regulars for end of year concerts. 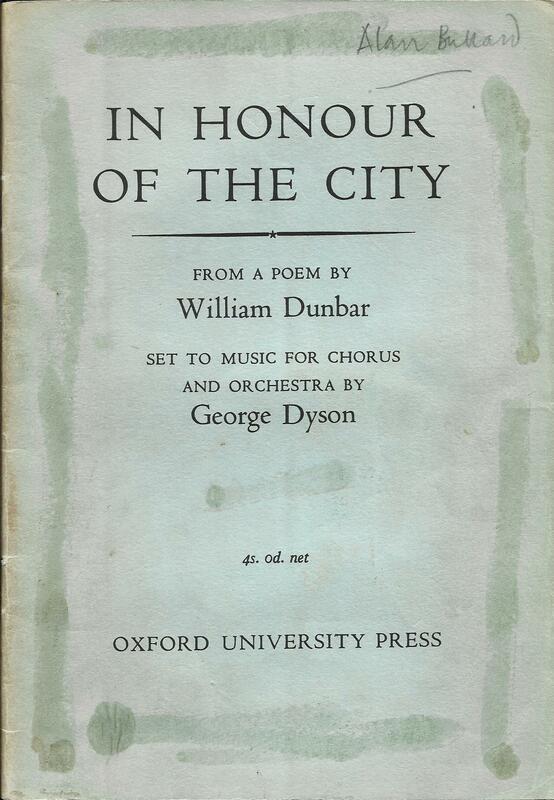 For an eleven-year old with quickly developing musical tastes, the impact of these relatively modern works (remembering that Dyson was still alive and RVW had died just that summer) was powerful – the sheer sonority of Vaughan Williams, the drama of Stanford, but, best of all, Dyson’s In Honour of the City, which combined the richness of Vaughan Williams with a driving and forceful melodic style spiced with exciting dissonances. 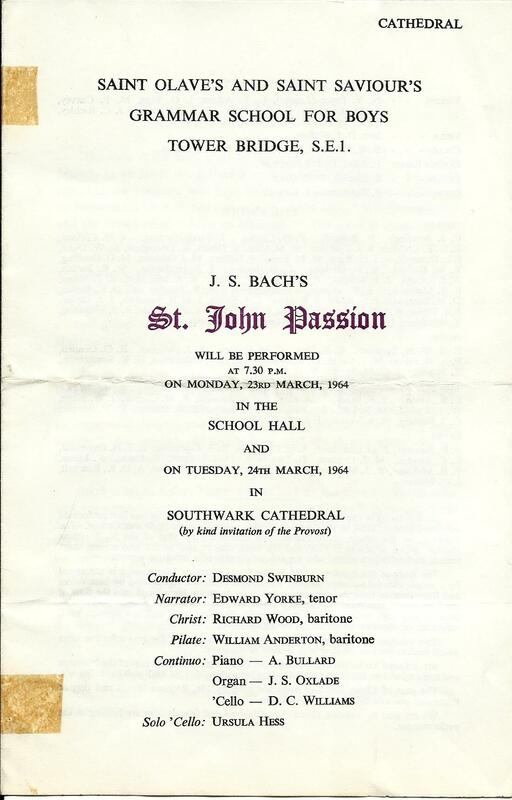 I don’t think I ever got the Dyson out of my head actually – but of all the works we performed at school it was perhaps J. S. Bach’s St. John Passion that had the most lasting influence. We sung this every Easter so I probably sung all the voices over the years, and also played keyboard continuo, and the memory of that great work has stuck with me ever since; particularly the beautiful descending three-note phrases of the penultimate chorus and the joyous exultation of the final chorale. Somehow, and not really intentionally, these and other elements found their way into my Passion-tide work – Wondrous Cross (OUP 2012). I wrote Wondrous Cross in 2011 for Lion Walk Church in Colchester, where I worship regularly. My aim was to write a Passiontide work which was dramatic and accessible to a range of choirs, by giving some flexibility with regard to solo voices and forces used. 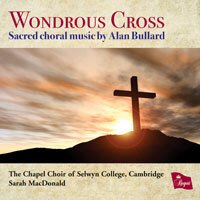 Our small amateur choir performed it during Holy Week 2012 with strings and organ, and in the same year it was performed with organ by the Chapel Choir of Selwyn College Cambridge, director Sarah MacDonald, who later recorded it for Regent Records. In presenting the Passiontide story I decided to focus on the crucifixion by using the ‘Seven Last Words’ of Jesus on the Cross and the Bible narration leading up to each. I set the narration for unison voice(s) and Jesus’s words for four-part choir, thus putting Jesus’s words into the mouths of all. I linked these passages by settings of other related texts and some traditional Passiontide hymns – and one spiritual. If it is performed in a worship situation, the congregation can join in with these. Underlying the whole work is the eighteenth-century hymn-tune ‘When I survey the Wondrous Cross’ which appears in the Prelude, in the background at various points in the work, and complete at the end. Here’s a link on Youtube with me talking about it, in which you can see that I’m a more experienced composer than broadcaster! Since publication in 2012 it has had a good number of performances – all over the UK and Scotland, but also in the Netherlands and the US, in concert halls, abbeys, cathedrals, and parish churches. I’m looking forward to hearing it again this Passiontide! 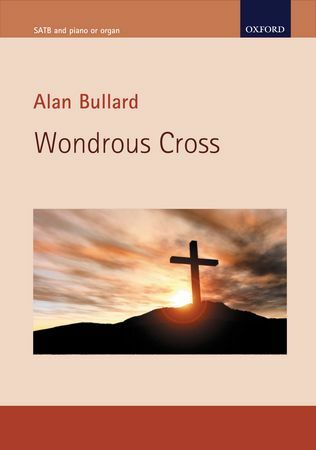 I am doing a workshop on Wondrous Cross and other works, organised by the RSCM, in Hornchurch in Essex on 7 March 2015. Details here. This entry was posted in Uncategorized on January 17, 2015 by alanbullard.